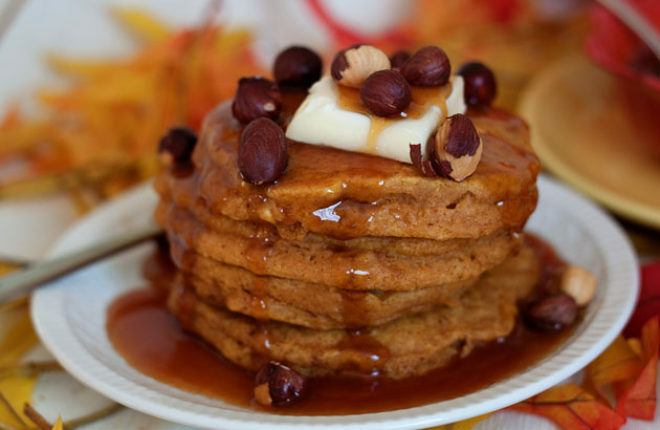 Looking for the perfect pumpkin pancake recipe? I was, too. I tried about a gazillion versions before I came up with this one of my own. They’re so good; even better topped with caramel syrup and hazelnuts toasted to perfection. Pumpkin frickin’ pancakes. I’ve been trying to perfect the recipe for years. Last year, I probably made ’em a dozen times – they were decent, even good, but none were the perfect pumpkin pancake. This year, I thought I’d be starting the process all over again, when lo and behold – the very first version I concocted were fabulous! So either I completely lucked out, or my standards have lowered greatly. 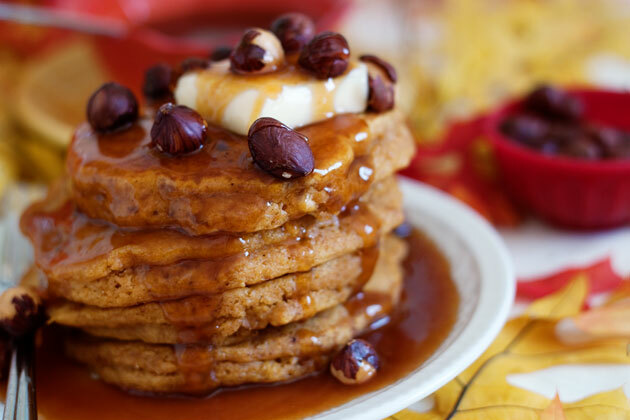 Either way, I think you’ll love these delicious-spiced pumpkin pancakes that taste just like Fall is supposed to – with just plain old maple syrup, or made truly decadent with Buttermilk Caramel Syrup and toasted hazelnuts. Spread the hazelnuts on a cookie sheet, and toast at 350 degrees for about 10 minutes, or until fragrant and toasty brown. Set aside. In a large bowl, mix together the flours, brown sugar, baking powder, salt, cinnamon, nutmeg, ginger, and cloves. Microplane zester + whole nutmeg. Add these to your Christmas list now – you need them in your life. In a medium bowl, whisk together the milk, eggs, pumpkin, vanilla, and melted butter. Whisk the wet ingredients into the dry ingredients. Mix just until incorporated, being careful not to overmix. Make the pancakes! Using a 1/3 cup measure, pour the batter onto a buttered griddle or into a large frying pan. They’re ready to flip when they start to look a little dry around the edges, and the edges are starting to form little bubbles. Cook on both sides until cooked through. Top with butter and Buttermilk Caramel Syrup, then sprinkle with ten or so hazelnuts per serving. I, for one, appreciate your persistence. 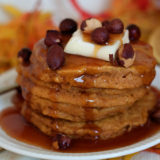 These pumpkin pancakes look and sound fantastic! I love pumpkin pancakes! These look great! I guess all that experimentation paid off! Love the addition of hazelnuts. Thanks, Jenn – the hazelnuts definitely sent them over the top! These look fantastic! And you’re right… I do need a microplaner! I’m wiping drool off my keyboard right now. These look so intensely amazing. those look super good! As a somewhat healthier alternative I’ve been making oat pancakes with rolled oats and oat flour with some flax, bran, almonds, raisins, sunflower seed (and anything else my eye catchers) thrown in. A plain rolled oats/oat flour pancake doesn’t taste or feel much diff than AP pankcakes. At some point I’d like to try with old fashioned oats to see if i can get a crunch. Yum, those sound so hearty! Incredible pancakes. The syrup….that is just a sin. 😉 One of my favorite things about trying to perfect a recipe is all the taste testing. Sometimes I get sad I don’t get to nibble anymore when it’s perfect rofl. 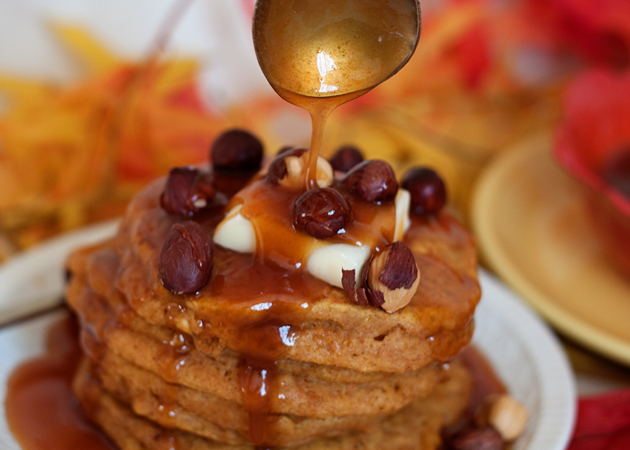 My husband and I LOVE pumpkin pancakes, and your syrup topping makes them look even more amazing! What a great recipe. Thanks for sharing!